OMEGA Flat Ratcheting Box Wrenches are designed to install Hi-Lok® fasteners and are made of high quality, heat-treated steel and finished with a nickel-chrome plating. This results in a long-lasting and durable tool. The small size and variable shape make the OMEGA Flat Ratcheting Box Wrenches ideal for use in tight areas. The head of the OMEGA Flat Ratcheting Box Wrenches fits easily onto a collar even without a line of sight, while the shoulder ring prevents the collar from slipping through the socket. OMEGA Hi-Lok® Flat Ratcheting Box Wrench, 1/4'' x 5/16'' hex with flange for Hi-Lok® and Hi-Lite® collars. ATBR-2531 replaces HLH149-250-312. OMEGA Hi-Lok® Flat Ratcheting Box Wrench, 5/16'' x 11/32'' hex with flange for Hi-Lok® and Hi-Lite® collars. ATBR-3134 replaces Hi-Shear® HLH149-312-343. OMEGA Hi-Lok® Flat Ratcheting Box Wrench, 5/16'' x 3/8'' hex with flange for Hi-Lok® and Hi-Lite® collars. ATBR-3137 replaces Hi-Shear® HLH149-312-375. OMEGA Hi-Lok® Flat Ratcheting Box Wrench, 7/16'' x 1/2'' hex with flange for Hi-Lok® and Hi-Lite® collars. ATBR-4350 replaces Hi-Shear® HLH149-434-500. The OMEGA ATBR2125 7/32'' x 1/4'' Hi-Lok Flat Ratcheting Box Wrench is one of thousands of quality tooling products available from MRO Tools. Please browse Hi-Lok Ratcheting Box Wrenches for tools similar to the OMEGA ATBR2125 7/32'' x 1/4'' Hi-Lok Flat Ratcheting Box Wrench. 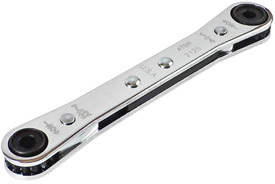 OMEGA ATBR2125 7/32'' x 1/4'' Hi-Lok Flat Ratcheting Box Wrench description summary: OMEGA Hi-Lok® Flat Ratcheting Box Wrench, 7/32'' x 1/4'' hex with flange for Hi-Lok® and Hi-Lite® collars. ATBR-2125 replaces Hi-Shear® HLH149-218-250 Quantity discounts may be available for the OMEGA ATBR2125 7/32'' x 1/4'' Hi-Lok Flat Ratcheting Box Wrench. Please contact MRO Tools for details.